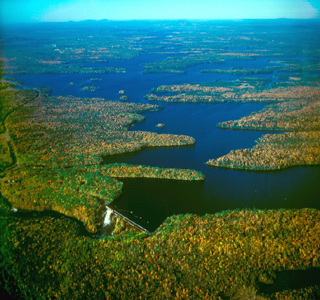 Project Summary: The Downeast Lakes Forestry Partnership secured a 27,000-acre community forest and a 312,000-acre conservation easement to sustain a rural economy. In 1999, Georgia-Pacific sold 446,000 acres in Downeast, Maine to Typhoon, LLC, a timber investment management organization. The citizens of Grand Lake Stream, a small community in Washington County, grew anxious about their continued ability to use these lands as a major part of their natural resource based economy. In response, the Registered Maine Guides, lodge owners, and foresters who “made their living” in these woods, joined together to form the Downeast Lakes Land Trust. Their goal was to buy the land around them, hopefully enough to support their economic needs. They recognized that land value, especially lake frontage land, was escalating sharply, and that it would not be long before land value in the area of Grand Lake Stream skyrocketed with the landowner selling “kingdom lots” and lake front parcels resulting in the forest becoming fragmented, and “no trespassing” signs and lake front gates becoming the norm. After meeting with the landowner, they recognized the need to get help if they were to reach their goal. They approached the New England Forestry Foundation, based on its recent success with the Pingree project, for help and together they formed the Downeast Lakes Forestry Partnership. Together, this community incubated, community led and community supported partnership negotiated a transaction with the landowner to protect 342,000 acres of working forestland: fee purchase of 50 miles (3,000 acres) of shoreline that now belongs to the State; fee purchase of 27,080 acres that now belongs to the Downeast Lakes Land Trust, and; easement purchase over 312,000 acres that now belongs to the New England Forestry Foundation. The challenge for this landscape scale conservation project was to complete the fee and easement purchases in less than three years in order to conserve the natural resource base that supported the growing local economy. When the landowner agreed to the fee and easement purchases wood markets were depressed and land prices were just beginning to increase. By the time the purchases were made some land had increased 10-fold in value and wood prices were still increasing. In a stagnant market with dwindling philanthropic funds for this type project, the partners were able to bring together a vast array of support so the project closed on time. Without this remarkable level of help, these lands might never again be available to support the community that instigated the project. Downeast Lakes Forestry Partnership brings together the New England Forestry Foundation (NEFF), Downeast Lakes Land Trust (DLLT), Wagner Forest Management, Typhoon LLC, National Fish and Wildlife Foundation, WalMart, The Conservation Fund, The Nature Conservancy, U.S Fish and Wildlife Service, Woodie Wheaton Land Trust (WWLT), Passamaquoddy Tribe of Indian Township; National Wildlife Federation, Wildlife Forever, The State of Maine; Elmina B. Sewall, the Lea Family and many year-round and seasonal residents who have volunteered to help make the partnership succeed. The Downeast Lakes Land Trust purchased, at fair market value, a 27,080 acre “community forest” from Typhoon, LLC that will form the basis for a growing ecotourism economy dependent on the natural resource base in the area, and the New England Forestry Foundation purchased a 312,000 acre conservation easement from Typhoon, LLC – the second largest forestland easement in United States history, at a cost of just $39.43 per acre. NEFF is responsible for monitoring this easement and an easement over the fee purchase lands forever, to assure compliance with the terms. The fee and easement lands will remain available to the public for traditional recreational activities including hunting, fishing, hiking, bird watching, and snowmobiling.